The industried best software for Screeners! FilmMaker XL= is a high quality, low cost alternative for film output in an easy to use package. FilmMaker LFP+ is a high quality, low cost alternative for film output in an easy to use package. 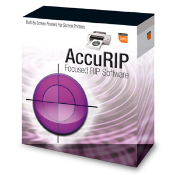 AccuRIP makes simple work of a critical process - sending separated art file data to your Epson Inkjet.